See something interesting in the neighborhood? 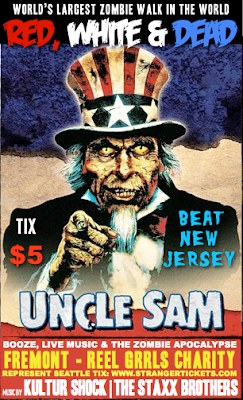 Email us at tips@fremontuniverse.com or submit an event here. You may have noticed a cordoned-off area on the sidewalk outside the Dubliner Pub (3517 Fremont Ave N.) lately that look like it was roughly the size of an outdoor seating area. Turns out that’s exactly what the Pub is hoping to turn it into. The Dubliner has applied for a sidewalk cafe permit with SDOT. Now the application entered a comment period, in which SDOT will accept comments from you, the general public, regarding your thoughts on the move. SDOT, Attn: Annual Permits, PO Box 34996, Seattle, WA 98124. SDOT will then make an application decision on whether or not to allow the permit after the public comment period has closed. 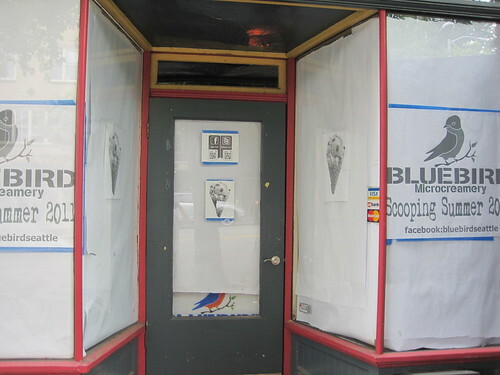 As you know, Bluebird Ice Cream is coming to Fremont. We had a chance to speak with owner Josh Kessler-Reynolds about the store, how they plan to work with other Fremont businesses and what kind of yummy goodness we can expect. Why did you choose Fremont for your 2nd shop? Fremont is the Center of the Universe, right? Apart from that, it’s just such a dynamic neighborhood. I can tell you that when friends and family visit, my girlfriend and I always include an afternoon in Fremont as one of the stops. The neighborhood just seems to offer a lot. From a more specific business perspective, the new neighbors [Hotel Hotel, Pie, Dubliner, etc. ]…provide a fantastic compliments to Bluebird Ice Cream. For those unfamiliar with Bluebird: it’s small batch, locally-sourced, artisan ice cream. We strive to make all of our flavors the-best-you’ve-ever-had: If you try a sample, you’ll want a full scoop. We source locally, taking advantage of our natural surroundings (like fruit from Remlinger Farms) as well as the wealth of like-minded artisan food makers in Seattle (Elysian Stout ice cream, anyone?) It’s ice cream made from local dairy, with all-natural and organic ingredients. Along with Theo, who provides Bluebird with their chocolate, what other Fremont businesses do you plan to work with? We love Theo. There are more special collaborations in the works between us. Pie and Ice Cream is an obvious match, so I would hope for some exciting things to happen between our two businesses. We’ve done some stuff with Homegrown, and I consider those guys to be great colleagues of mine. I hope for further collaboration and cross promotion in the future. Caffe Vita just up the street will be collaborating with us, and next door to that Bluebird Ice Cream will soon be available at all Via Tribunali locations. When we have our grand opening (Aug 1st? No promises.) We’ve already been discussing with the Pie girls and the guys at the Hotel Hotel hostel upstairs about hosting some kind of block party, along with the Dubliner, so keep your eyes out for that. I’d encourage anyone who has a place that they want to serve Bluebird ice cream to send an email (bluebirdseattle@gmail.com) and we’d love to supply your favorite restaurant, market, or grocery store. I was just checking Fremont Universe to see if anyone else reported about a clearly mentally disturbed man screaming insults at the people/workers inside of Paseo on N Fremont earlier this evening (around 7:45, 8pm). He kept screaming at them, then flinging himself into the street–very, very nearly getting hit by a truck. He kept running in and out of traffic, screaming at the restaurant. Then he kept walking up N Fremont, returning a bit later to talk at the people in Paseo again. My friend and I were across the street, having finished dinner at Brad’s. We finally called the police, because he’d come back a couple of times to scream at them, and the way he kept darting into traffic, we were worried he might get hit by a car. He was a white guy in his late 30s, 40s, close to 6 feet tall, average build. Wearing a white-ish baseball cap with a dark rim, he had glasses, scruffy facial hair, and a plaid jacket/shirt on. A bit later, when we were driving home (around 830), after the guy had seemingly left the neighborhood, we saw a cop car arrive. Not sure what was going on, but that guy seriously needs some help. We’ll take a look around in the AM and see if we can find out any info. Thanks for the tip, JK! It’s that time again. Friday, July 1st is the first Friday on the month and so the Fremont First Friday Art Walk will go down between 6-9 pm. In the spirit of the “Red, White, & Dead” zombie gathering in Fremont the next day, Fremont Arts Council will host a booth starring a make-up special-effects artist teaching the undead-curious how to do easy scars & zombie make up starting at 6:30pm at the Lenin Statue. Pickled Okra string band will also be performing their jig-inducing tunes in Lenin Square from 7:30pm – 9pm. Address: 3409 Woodland Park Ave N.
Exhibit: Born of Scottish parents, raised in Switzerland, trained by the Dutch at the de Kooning Academie, figurative painter Fiona McGuigan brings a worldly view to her paintings of wrestlers and dancers. Her current work is all about capturing the human figure in motion, finding the moment of impact when bodies collide and exploring the nationalistic overtones found in images of Swiss wrestling. Exhibit: Cigar Box instruments date back to the 1840’s, and thanks to artists like John Hughes & Ed McGehee, you can still find them being displayed and sold at tucked-away jewels like Fremont Cigar. And while you’re there, take in the luminous, summer-drenched photography of Josh Hughes – a budding photographer and student at Central Washington University. For a full list of events, artists and venues, check out the First Friday site. Happy walking! Fremont Abbey is bringing tons of great music, dance, art and more to the neighborhood in July. But then again you already knew that, didn’t you? That’s what they do. Check out their list of upcoming events below and keep an eye on Fremont Abbey’s website and Facebook page for more news, updates and how to buy tickets. July 12 – The Round 74, featuring Laura Gibson, Tomo Nakayama, Bright Archer (Johanna Kunin) as well as poets and painters. Weather-permitting, the Abbey will also be doing a community BBQ from 6:30-8:00 outside on the Abbey patio (BYO grilling items, they’ll provide the rest), and then possibly some music outside in a secret/epic sunset location (9ish), then back to the Abbey for the main show. Sounds all kinds of awesome. July 15 – Marian Call (Wildysworld.blogspot.com named her album “Vanilla” the number one indie release of 2008 out of 600 albums). The first one wants to get from Fremont to Tacoma but isn’t sure how. They don’t have their own car. The bus isn’t an option and a train is too pricey. The second one knows they’re driving from Fremont to Tacoma but they’re not all that excited about dropping a chunk of money on gas to get there (especially these days…). Fremont start-up Zebigo.com wants to bring these two people together and solve both problems. According to CEO, Jonathan Wolff, Zebigo is a “dynamic ride-sharing service” that gives people with a destination in mind a way to reach out to drivers and passengers interested in partnering up to get there. Whether your concern is financial or because you want to do your part to cut down on unnecessary congestion, gas consumption or carbon emissions, Zebigo wants to help you out. “We provide an alternative for travel to any event, concert or sporting event,” says Wolff as he breaks down the many reasons Seattlites have for short-term travel. So I know what you’re thinking…”You want me to get in the car with a complete stranger and let them drive me somewhere?” Zebigo is extremely aware of that concern and they’ve instituted a strict policy for make sure the driver and the passenger are covered. User comments and ratings help weed out the good drivers from the bad ones and passengers can request background checks on any driver. Zebigo also keeps a paper-trail of every trip and has an automated system that allows prospective drivers and passengers to speak without giving out personal information like phone numbers. In other word, safety is a paramount concern. Currently Zebigo is in a beta mode, working strictly in Seattle. as they learn what people like about their service. So far, over 600 riders have signed up for the program and 10 completed trips have been recorded. Roughly-speaking, a 15-minute ride will probably cost a passenger about $5, a half-hour ride will run you about $15. Zebigo chose their Fremont location based on access to the Silicon Canal as well all the major highways of the area. Not to mention the fact that many of their developers live the area. Social media is a big deal to Zebigo, who sees outlets like Facebook and Twitter as “way to share organically.” So, you know, follow them on Facebook and Twitter. And of course check out their website to find out more about signing up and booking your first Zebigo trip. It’s a great opportunity to help shape an up-and-coming Fremont-based business. The city is looking to add a little creativity to the Burke Gilman Trail with the help of Washington artists. The Seattle Office of Arts & Cultural Affairs and the Seattle Department of Transportation are looking for an artist or a team of artists to create art for the multi-purpose trail. All artists must live in the state of Washington. The budget for the project is $80,000 which includes all costs to design, fabricate and install artwork. The application deadline is 11 p.m. on Monday, August 1. More information can be found here, or apply here. We recently noticed that almost all of your dessert options were covered in Fremont. However, when it comes to dessert, there’s always room for one more. If you attended the Fremont Fair, you might have noticed Bluebird’s Ice Cream Cart or even sampled some of their yummy ice cream. If you liked it, good news. Bluebird is opening up a “microcreamery” on Fremont Ave in between Pie and the Dubliner. This will be Bluebird’s second store, their first is located in Capitol Hill, And if you’re not familiar with, they’re all about local and fresh ingredients. The ingredients we use are almost entirely local, organic whenever possible. The dairy comes from all-natural, hormone-free cows in Washington and Oregon. The stout is brewed at the Elysian, and the coffee is roasted at Stumptown. All of the fruit comes from the Northwest. The baked goods are from Seattle bakers that we think supply good-quality, local, natural products. The plan is for the store to be opened at some point this summer. In the meantime, follow along with Bluebird on Twitter and Facebook. If you’re not already familiar with signature dishes and drinks like their “Velvet Bullfighter,”you’ve got a got reason to try them out come July. To celebrate their anniversary, they will be offering an Anniversary Tasting Menu for $35 which will offer each guest a sampling of their most popular dishes as well as cocktail & wine specials for the entire month of July. To accommodate the late night crowds, Hunger has just opened its back bar lounge for parties of up to 15 people. Plans are also in the works for an underground “speakeasy” to open late fall/early winter with a live venue and their take on prohibition era cocktails. Hunger is open for dinner every night from 5pm to closing, daily happy hour from 4-6pm, Weekend brunches 10am-2pm, and late night bites from 10pm-Midnight Wednesday through Saturday. Here’s some news, notes and updates about Fremont-related happenings. Miguel Hernandez could barely speak English when he moved from Denver to Seattle in 1999. Eleven years later, he’s running Fremont’s Fleur de Lis Garden Ornaments and reviving a local landmark in the garden-ornament trade. One of the Phish-y lip-syncers from the Solstice Parade recounts what it was like to be a part of the festivities. The new arts space West of Lenin is bringing live theater back to the Fremont neighborhood — and hosting cinema, music and other artsy ventures, too. There was an alleged assault outside a bar in Fremont this weekend. Maybe? It sounds like? Kinda? Got any Fremont-related news, tips or updates to share? Email us at tips at fremontuniverse dot com. Take a look at our directory of Fremont technology companies. After all, it's the Silicon Canal.